Welcome to Paul S. Johnson, OD, PC. For our current patients, we appreciate being able to continue with caring for your vision needs. For new patients we look forward to meeting you and helping you with all of your optometric eye-care needs. Dr. Johnson, with 35 years of experience, has long been recognized as a leader in patient care. We offer the highest standards of quality and individualized attention in a relaxed, professional atmosphere. Formerly associated with Eyemaster's at the Galleria, Dr. Johnson is back in private practice and now can offer a full range of options to meet your eyecare needs. Our goal is to go beyond the routine. We of course offer standard glasses and contact lenses. What is considered an upgrade at other offices is our "entry level" solution. The advances in technology for both contact lenses and spectacle lenses are dazzling. Hi Definition lens solutions are now available and affordable with glasses and contacts. We are having great success the newest technology to correct unhappy post-PRK and post-LASIK patients. Myopia control in children is also a speciality with CRT and custom WAVE-Design Ortho-K lenses. For those with high astigmatism or keratoconus, we prescribe and dispense scleral gas permeable contacts. These lenses are rigid and give the best over all vision but are barely noticeable as they ride on the white part of the eye and not the sensative cornea. We stock a large selection of contact lenses as well as fashionable frames - including Silhouette - that are sure to suit your eye-wear needs. Please don't hesitate to contact us if you are concerned about your general eye health or are interested in diabetic vision screening, hard-to-fit contact lenses, or the best pair of glasses you have ever worn. 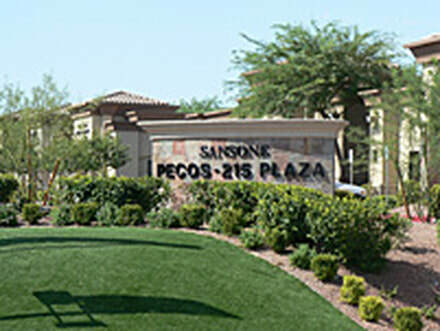 Our office is just off the 215 and S. Pecos (and Pebble) in the Sansone Pecos - 215 Center in Henderson. We look forward to seeing you!